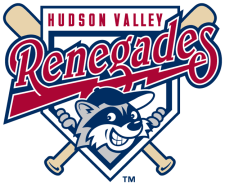 The Hudson Valley Renegades suffered a 4-0 shut-out at the hands of the Aberdeen Iron Birds on Sunday at Ripken Stadium. Aberdeen scored first in the third inning on an RBI single by Michael Flacco that scored LJ Hoes to give them a 1-0 lead. The Iron Birds struck again in the fifth. Hoe reached on a double to right then later scored on a passed ball to increase the lead to 2-0. Aberdeen would add a pair of runs on the seventh and eighth to take a 4-0 victory to close the series. The Renegades threatened several times but were unable to push a run across, going 0 for 7 with runners in scoring position. Wilmer Amonte suffered the loss, pitching 4 1/3 innings and allowing 2 runs on 4 hits while striking out 2 and walking 2. Kyle Ayers pitched the final 3 2/3 innings surrendering 2 runs on 5 hits with 4 strikeouts and a walk. The Renegades (1-2) head home for their 2010 home opener at Dutchess Stadium against the Staten Island Yankees (1-2). Miguel Sierra will make the start in game one of the series, facing Wilton Rodriguez of Staten Island.